Apollo was born in January 2018 and doesn't have much self-confidence yet. Since coming to the Sanctuary from a local rescue organization, he's let down his guard with some of his caregivers. He's still nervous around most people but is a friendly guy at heart. He'll sit next to some folks for petting and share a tail wag on occasion. Apollo is interested in going for walks and will let people to leash him up. At first, he only wanted to walk if his doggie roommate went with him, but he's been working up to solo walks. While he's on the Dogtown trails, he relaxes as he begins to explore all the different smells, and his caregivers have been trying to encourage him to enjoy these outings. Next, he'll be working on getting more comfortable climbing into vehicles so that, eventually, he can enjoy rides too. Apollo has a good appetite and his favorite 'dessert' is cream cheese. He doesn't mind the snow, and during the winter he would chase after snowballs thrown near him. He's done well with all dogs he's met at the Sanctuary and seems to gain confidence by watching them. He still has a lot of puppy energy and would do best in an active home. 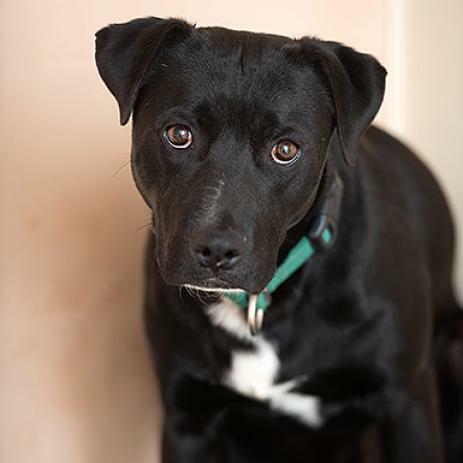 Because he's shy and fearful with people, he may try to run away, so Apollo will need an understanding person or family to show him that he is safe. Once he gains confidence, he'll make a playful and fun companion.